As the seasons change and fall arrives, warm comfort food brings us inside as we start to bring out our sweaters and jackets. Sandals are put away and pumpkins magically appear on almost every corner. I love Autumn and all it’s colors. So why not celebrate the brilliant colors with a few slices of this pork tenderloin on your dinner plate? 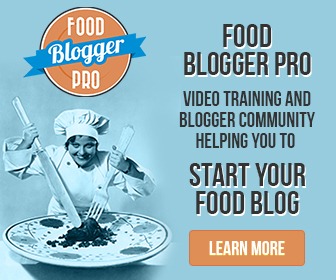 You will love this because it’s ridiculously simple to cook ~ and what a bang! Mouthwatering intense flavor in every bite. This main course would be excellent with steamed veggies or cheesy potatoes AuGraten. And you don’t want to skip out on the chives, they really add the perfect complementary flavor for this dish. Working with pork tenderloin you will probably notice one side covered in something called ‘silverskin’. This is a thin layer of fat that is tough to eat and is easily removed with a sharp knife. A pairing knife works best but a chef’s knife will work just fine too. To remove it, just slip your knife right under it and gently work your knife back and forth towards the end of the meat. It helps if you start in the middle and work your way outward. Also you can take it off in a few smaller strips instead of trying to get it off all at once. This will help you from cutting out a lot of good meat. When sauteing your meat in the pan, you’ll need to brown the sides as well as the top and bottom for this recipe. If you have a good pair of tongs, stack two or three medallions on top of one another, then grab the ends of the stack with your tongs and brown the sides all at once. Some medallions may not want to sit nicely on their sides to brown (they just fall over) and this trick will help brown the sides efficiently! If you like spicy food, but your digestive system doesn’t, (or your kids) just omit the hot sauce and add a teaspoon more of the orange juice. 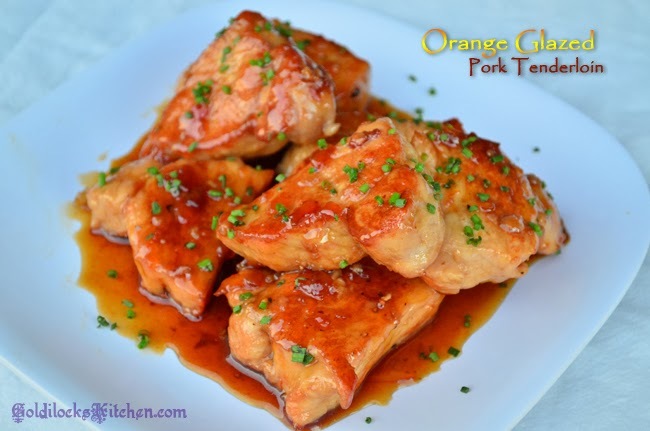 Pork tenderloin medallions cooked in a sweet and spicy orange glaze garnished with chives. Quick easy and delicious weeknight dinner. Trim excess fat and dry pork tenderloins with paper towels. Using a sharp knife, slice crosswise into 1 1/2 inch pieces (medallions). Season lightly with a pinch of salt and pepper. Heat oil in a large skillet over medium high until just smoking. Cook pork medallions until well browned all over, including sides, about 10 minutes. 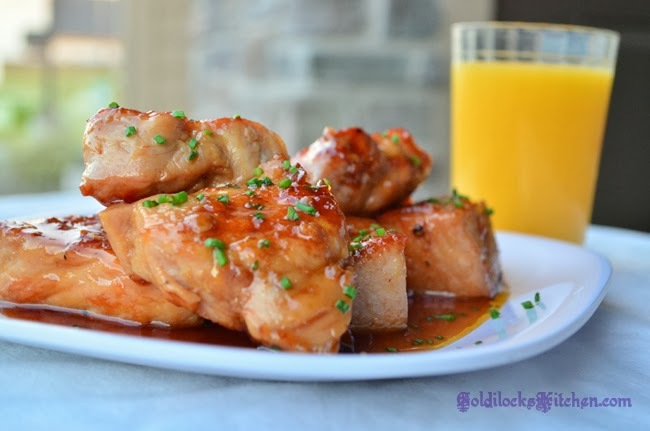 While pork is browning, whisk marmalade, orange juice, and hot sauce together in a small bowl. When pork is nice and golden brown on all sides, turn the heat to medium and pour the marmalade mixture over pork. Cook, flipping the medallions occasionally until meat registers 145 degrees, 3 to 5 minutes. Transfer the pork to a platter and sprinkle with chives. Serve.